"Notes From the Road: Melbourne #1"
The carnival has moved east. 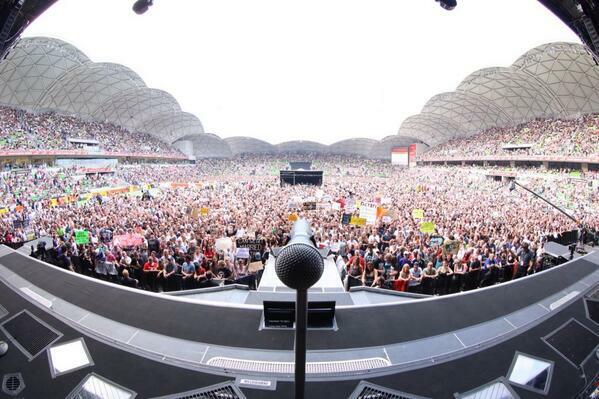 Bruce Springsteen and the E Street Band have set up camp in Melbourne for two stadium shows. Outdoors, the opening night is sold out. Dan Sultan opened proceedings in the late afternoon. Next came reunited national treasures Hunters & Collectors. The stadium is half full as the Hunters move things up a gear with Say Goodbye. It always brings a smile to hear a few thousand blokes singing in unison, ‘You don’t make me feel like a woman anymore’. A highlight of their set was the anthem, “Throw Your Arms Around Me” with its’ adjusted lyrics which now highlight the plight of asylum seekers. Then it was time for the main event. Almost twelve months ago I wrote in our national newspaper, The Australian, that Bruce and Co. ‘were the greatest rock and roll show on earth’. Now… they’re better than that. Sitting in a hotel room, with the show still ringing in my ears, I want to skip the chronological order of the set list and just tell you how brilliant, joyful and moving the show was. It was if Bruce and the E Street Band use ‘great’ as a starting point and then head off on a whole other trajectory. All I know is, after seeing a thousand-and-then-some concerts, this was one of the truly special nights. It was that rare beast that makes you feel uninhibited and fills you with some kind of faith in your fellow travellers and confirms your teenage belief that rock and roll can soothe your soul and make the world seem a whole lot brighter. Thinking back to that first night in Perth, Bruce knew what he’d be bringing all along. Tonight, like all magic… one and one made three… a hundred times over. The sun was sticking around when the show started. The E Street band hit the stage and Bruce appears from the back of the drum riser. He announces a special guest, Eddie Vedder. They open with AC/DC’s “Highway To Hell” and it’s delivered with all the zeal of an encore. Next comes “Darkness On The Edge of Town” with Vedder inhabiting his verses like he wrote them. It’s a stunning collaboration and then Vedder is gone. Bruce kicks into Badlands and Jake Clemons gives the first of a series of terrific solos that are dotted through the night. Next comes a gritty “Seeds” with the entire horn section amped up and stuck on a menacing groove. It’s followed by “High Hopes“, replete with Tom’s nod to Hendrix on the solo and The Saints’ “Just Like Fire Would” which the audience sing word-for-word back to the stage. For my money, it’ s the best version of the song the E Streeter’s have done to date and there have been some cracking renditions in that mix. The sun has disappeared and Bruce spots a sign for Jole Blon: a relative obscurity, it’s a gorgeous slice of Cajun rock with Charlie shining on accordion. The singers come front and centre to add a little gospel and Roy backs them up by channelling the mood of the Church on the ivories. “Hungry Heart” gives Bruce a chance to hit the floor and shake a few hands. The stars are in alignment and this version is something special. Bruce tells the crowd how much he ‘loves it here’. Not wanting to do the ‘same thing twice’, he gives the capacity crowd something special, the Born In The USA album played in its’ entirety. 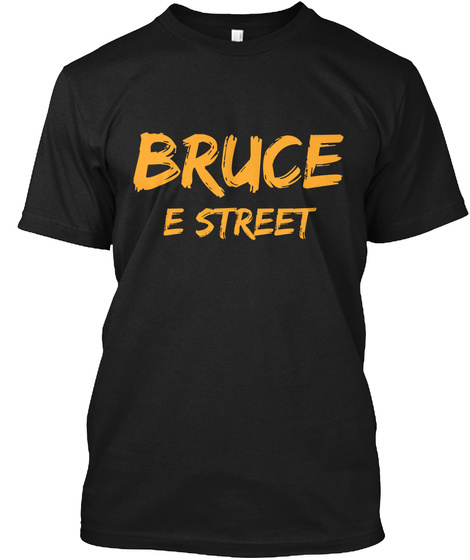 This is the first time Bruce has done an ‘album show’ in Australia. A superb choice, it was the record that broke him commercially in this country. We all know the sequence and we all know what a wonderful ensemble piece it is, but, listening to it in this context, this writer was again floored by the depth of the material. Every mood seems to be captured in the grooves: the good, the bad, the troublesome and, that word again, joy. ‘Only in Australia’, said Bruce as two men in ‘Cindy wigs’ came on stage to dance with Miss Mizelle during “Dancing In The Dark“. Even though we’ve heard it a million times before: tonight it shot an arrow through this reviewer like it was the first time. It was that kind of night. “My Hometown” was solemn and beautifully austere and it closed the ‘album’. But, the show was hardly over. A sign was gathered up for “Factory” and Bruce told a story about when he was ‘five or six’ his father worked in the Ford Factory in Brunswick New Jersey. He then took a broadside at the ‘reckless and greedy people’ who tipped the world into GFC turmoil before meditating on the ‘meaning of work and the importance of work in your life’ before calling for the song ‘in the key of F’. The final furlong of the main set included “Shackled and Drawn“, “The Ghost Of Tom Joad“, “The Rising” and a rousing “Land of Hope and Dreams“. “Heaven’s Wall“, which is fast becoming a highlight from the High Hopes album, was followed by a house lights up, take no prisoners, “Born To Run“.